Following Gov. 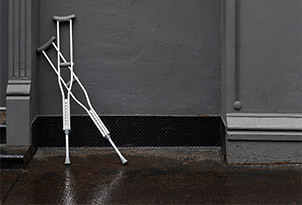 Andrew Cuomo's State of the State and Budget Address in January, which included a congestion pricing plan, Mayor Bill de Blasio has announced a pilot program to reduce "pedlock" (pedestrian gridlock) in the city. 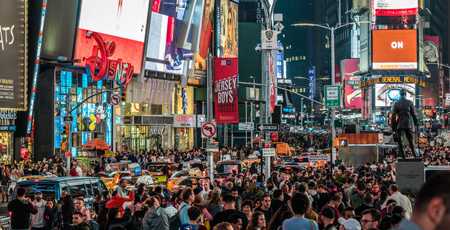 For a period of ten weeks beginning June 1, the Step Lively Initiative will deploy fifteen people in and around Times Square to prevent bottlenecks on the area's sidewalks by discouraging clustering and "slow-streaming," particularly by visitors to the city. A gentle tap on a loiterer's shoulder or forearm will be used to signal the need for speed. If the program is a success, it will be expanded to other areas that suffer from overcrowding at various times. Mayor de Blasio noted that the Step Lively employees will not be called pushers, which has too many negative connotations, and will instead be known as fluffers. The City commissioned the Swedish company Iris Hantverk to design fluffing sticks (pictured below) for the tap part of the communication. "Pushers" were used in New York City as early as 1918 during the chaotic launch of the 42nd Street Shuttle. The unpopular "sardine packers" were retired with the advent of automatic doors. Mayor de Blasio said that this tradition of prodding now needs to be applied to street level. "We view this as a quality-of-life issue," the Mayor said. "If you want to walk slow, there are plenty of cities where you can do that. Come on! This is New York!"